WaPo: "A Few Good Men" is a brass-buttoned, square-jawed huzzah for military justice that's thankfully free of the messy moralizing of the Vietnam age. An energetic adaptation of the Broadway play, this riveting court-martial drama looks at the eternal conflict between a civilization and the barbarity inherent in its defense. Essentially it is "The Caine Mutiny" in dry dock with Jack Nicholson and Tom Cruise going macho a macho. Entertainment Weekly: Directed by Rob Reiner, from Aaron Sorkin’s adaptation of his hit Broadway play, A Few Good Men is a thrillingly effective crowd pleaser. Like all courtroom dramas, it’s gimmicky and, on some essential level, synthetic. It’s really an elaborate piece of construction, with too many links to earlier Cruise vehicles (the business with Kaffee living in the shadow of his deceased lawyer father is just leftover Top Gun). Yet when a courtroom drama has been made with this much skill and star power, it’s an irresistible throwback to the sort of sharp-edged entertainment Hollywood once provided with regularity (and, these days, has just forgotten how to make). NYTimes: Mr. Nicholson doesn't steal the film, which would mean that he somehow separates himself from everybody else in it. Rather, in the course of only a handful of scenes, he seems to suffuse the entire production, giving it a weight, density and point that might not otherwise be apparent. LATimes: While watching Nicholson and Cruise chew on each other and gnaw on the scenery is quite a treat, everything in "A Few Good Men" doesn't work as efficiently as their performances. The film's plot, taken from Sorkin's long-running Broadway play, is more contrived than creditable, motivations are not always clear, and some characters, for instance Kiefer Sutherland as a praise the lord and pass the ammunition Marine, are not very convincingly acted. Roger Ebert: What happens is that the movie brings us to the brink of a courtroom breakthrough, and then we get the scene that undermines everything, as Cruise explains to his friends what he hopes to do, how he hopes to do it, and how he thinks it will work. When Nicholson's big courtroom scene develops, we realize with sinking heart that it is following the movie's scenario. That robs us of pleasure two ways: (1) We are not allowed the pleasure of discovering Cruise's strategy for ourselves, and (2) Nicholson's behavior seems scripted and inevitable, and is robbed of shock value. The movie is reduced then, to a lesser pleasure, that of watching good actors do good work. Nicholson is always fun to watch, as he barks and snarls and improvises new obscenities. Cruise is an effective contrast, as the immature young officer who discovers himself. Bodison, the stubborn defendant, gives the most interesting performance in the movie, because we can see the battle going on inside and the movie allows it to happen almost as a separate scenario. But the movie doesn't quite make it, because it never convinces us that the drama is happening while we watch it; it's like the defense team sneaked an advance look at the script. Demi Moore's last good role? This one takes me back in particular. During my brief and ill-fated stint in Basic, our first real day off featured a trip to a break room and a choice between watching A Few Good Men and The Lion King... and that's how I spent my first day of R&R in the Army watching a movie about the Marines. Chrysostom, as I was reading the post I was trying to remember what Demi Moore did after this film. So I checked IMDB and the answer appears to be a fair amount, but nothing really stands out to me (in terms of oh, yeah, that was notable) beyond GI Jane and Striptease, both of which at least had lots of promotion if not being good films (I don't think I've seen either). Anyways, I remember this film more for certain scenes than for being a good story, which maybe says what needs to be said about it. Notable for standout product placement by Yoohoo. What was her first good role? She was memorable in St. Elmo's Fire, for good or ill.
Not unlike Wall Street, I feel like this film's greatest legacy has been people taking the villain's big monologue out of its context and unironically adopting it as their worldview. "Son, we live in a world that has movies, and those movies have to cast people with acting chops. Who's going to do it? You? You, Tom Cruise? I have a great responsibility than you can possibly fathom. You weep for Moore, and you curse the writers. You have that luxury. You have the luxury of not knowing what I know - that this script, while tragic, probably saved jobs, and my existence, while grotesque and incomprehensible to you, saves movies." -Demi Moore was 8 months pregnant when she auditioned for the part, and was cast over Linda Hamilton and Jodie Foster. -Jason Alexander was going to play Sam Weinberg, but had to drop out when Seinfeld got renewed for a second season. -Nicholson worked 10.5 days on the film. He did the courtroom speech 40-50 times, including for shots that were only to get the reactions of Cruise, Moore, Pollack, and Bacon. -Sorkin was asked why Moore was cast for Galloway if she wasn't going to sleep with Cruise's character. Sorkin replied that women have other purposes than sleeping with Cruise. You know that thing, where you say 'elephant' over and over again, and it loses all meaning? Now imagine that, only you have to also have to have an emotional breakdown, over and over again, while saying it. Do the emotions, themselves, lose all meaning? Do you find yourself, after 30 or 40 takes, floating off from reality, the angry curses coming from you like hiccups? Oof, I can't imagine what that must be like. How exhausting. I saw this after I saw The General's Daughter, which stole some thematic thunder from this movie, not to mention I think I saw the second half before the first. Similarly, I saw this before I watched Twin Peaks, which stole some of James Marshall's impact in that series. I guess there's just a chain of injuries emanating from this movie; I thought this would have been the movie that stole Kevin Pollak from stand-up (mostly), but I see that it was his like 9th role. Anyway, it's perfectly cast, it has a near-Witness-for-The-Prosecution climax, and the script gets the benefit of Sorkin still being hungry. Have either of them had a make out scene in one of their movies? A quick scan of IMDB suggests possibly nothing bluer than When Harry Met Sally and An American President. Not explicitly with tangled sheets and pelvic thrusts and all, but it seems to me that we do see Tom Hanks and Julia Roberts getting post-coitally dressed in Charlie Wilson's War. I then went on to look at Reiner's directorial credits on IMDb but got all distracted by the realization that he has apparently made eleven features since The American President and I have seen none of them. Weird. 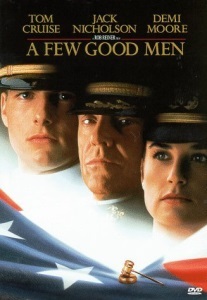 A Few Good Men was his fifth movie in a run that included This is Spinal Tap, Stand By Me, When Harry Met Sally, and Misery. That is more solid middlebrow stuff than most people can produce in a full career. Anyway, maybe "hook up" is a more apropos term than "make out." I think it's more that both of them are unlikely to portray any romantic scenes that don't directly relate to the main plot. This is one of those movies which, should I run across it when channel surfing, compels me to watch it to the end. Also, the source material provides a great theater memory: I saw a community theater production in which the director created forced perspective magnificently by placing a scaled-down guard tower -- manned by silhouetted kids in uniform -- upstage. It worked.